Rehearsals for Richard III are underway. After a week of rehearsals, the company of actors, creatives and stage management feel fully immersed in the world of Medieval England, the world of the play, and perhaps most intensely we find ourselves inside the head of Richard. A strange place to be. Quite a scary place to be. The week begins with the whole company coming together for a meet and greet, Jeremy Herrin welcoming us to Headlong and John Haidar – our director – introducing to us the play and the production. Chiara Stephenson – our designer – shares her model box of the set. The moment that a new company gets to see a scale replica of the set is always one of the most exciting in any rehearsal process. It starts to get all of our imaginations firing and immediately gives the company a shared picture of the direction we’re moving in. This shared picture is of a world full of circles and glass, and swathed in black. The visual world is creating a sense for the audience of being inside Richard’s head; a space that is full of tricks and deception and double standards. That’s the world in which one of Shakespeare’s most infamous villains operates. During the rest of the week we learn more and more about that world. Tiffany Stern – Professor of Shakespeare and Early Modern Drama at the Shakespeare Institute – came in and spoke to us about the history of the text, and some Early Modern production history of the play. 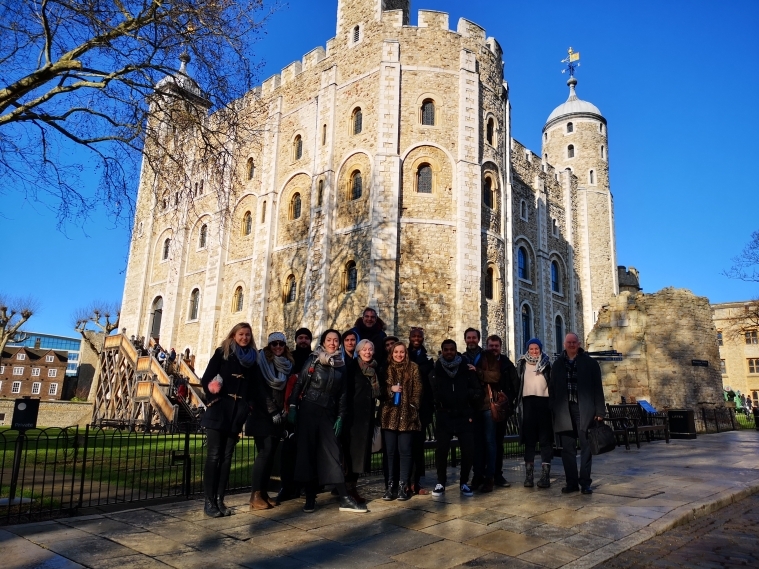 On the next day the whole company took a field trip to the Tower of London and were joined by John Watts, Professor of Late Medieval History at Oxford University. John spoke to us about the period and the political machinations during the Wars of the Roses, and the tangible history of the characters of the play as real people who lived and breathed is now really prominent in our minds. The Tower is almost an additional character in Shakespeare’s play, and is the scene of the death of King Henry VI, and where the two young princes famously disappear to. To be able to spend some time in the physical space where scenes from the play occurred is a real gift, and has given us a solid platform from which to jump into next week and really explore the fiction of the play. Our revelatory adaptation of Shakespeare's Richard III kicks off from 1 Mar – 13 Apr. For more info and to book tickets, click here.